yet again have bleeding heart apologists trying to defend the actions of the cowards who perpetrated the crime. Shame on the lot of you! You actually believe that don't you ! I have to say that it is incredibly sad that on no more than 20 hours after one of the most vile terrorist attacks to happen in Europe - an attack by armed gunmen on a football match, a concert, and at bars and restaurants against unarmed civilians, we yet again have bleeding heart apologists trying to defend the actions of the cowards who perpetrated the crime. In the same way we have thick right wingers wanting to nuke muslim countries. Views like yours belong in the days of the slave trade. Yes the old Iraq war gets trotted out again. Correct me if I'm wrong but France refused to get involved in that war yet their citizens have been attacked twice this year. The first was about a cartoon. It was an illegal invasion not a war. Might be a good idea to stop engaging in pointless debate with the forum imbecile and remember 130 people are being mourned in France. I will leave others to condemn this shite. I simply cant cope with this level of stupidity and I am grateful every minute that i am fortunate enough not to have to deal with it on a daily basis face to face. hAving to work or live next to someone like you must be utterly intolerable. Not a single poster on here has EVER said this is purely about Iraq. FFS kendo we already have enough stupidity with Dickson without you pitching in with the same nonsense. This is that intelligence that leads to a six-figure salary in action, the ability to see things that no-one else can see. Have the authorities closed the site down yet? That is an utterly moronic statement, even by your standards. Of course it's racist. If the guy had been white you'd have had no problem. This is the issue right here. People aren't even intelligent enough to realise they are engaging in racist behaviour. This is what the organisers of these atrocities wants us to do. They want to sow terror and division. Sounds to me like they are winning. Did it not occur to you to check your watch when the guy was praying? All creeds and colours are commiting atrocities in the name of Isis. A year sgo I heard an Indonesian looking guy reading aloud from the qur'an, he had a rucksack so I moved to the next coach. What creeds other than Islam are committing atrocities in the name of the Islamic state...? 20,000 citizens from 100 countries are fighting for isis in iraq. That doesn't answer the question, though - have you been taking lessons from Stud? Is there anybody you like to sit beside? One was also a French national. Where should he have been sent home to? I will explain it to the terminally stupid like yourself. Most of these attacks are carried out by citizens of their own country. Is that dumbed down enough for you my simpleton friend? Its quite simple. The guy who killed all those people at the concert was a French national. 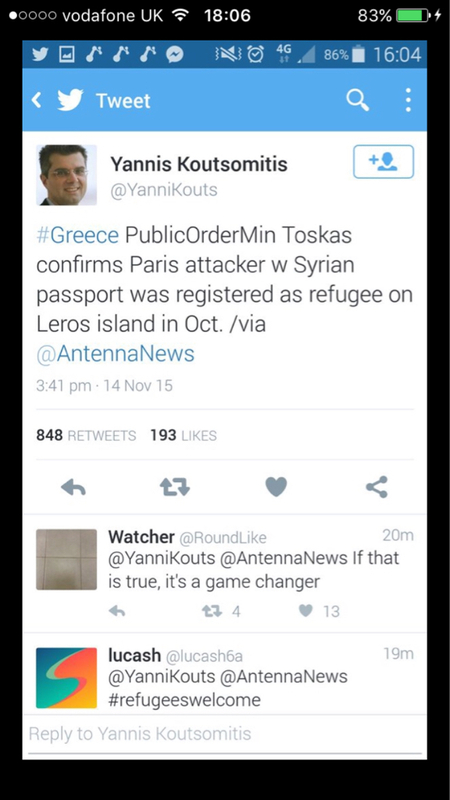 To clarify that, it turns out that one of the attackers was carrying a refugee's passport. A bit more accurate, no? Oh thank GOD. We can now engage in the time honoured tradition of racial discrimination against all migrants guilt free. When did I dispute that you moron?